(Nanowerk News) Researchers from the London Centre for Nanotechnology have made new compact, high-value resistors for nanoscale quantum circuits. The resistors could speed the development of quantum devices for computing and fundamental physics research. The researchers describe the thin-film resistors in an article in the Journal of Applied Physics ("Compact chromium oxide thin film resistors for use in nanoscale quantum circuits"). One example of an application that requires high-value resistors is the quantum phase-slip (QPS) circuit. A QPS circuit is made from very narrow wires of superconducting material that can exploit a fundamental, counterintuitive quantum mechanical property called quantum tunneling to move magnetic flux to and fro across the wire, over energy barriers that would be insurmountable in the everyday world of classical physics. In 2006, scientists from the Kavli Institute of Nanoscience in the Netherlands proposed that a QPS circuit could be used to redefine the amp – a standard unit of measure for electrical current – by linking it to fundamental properties of the universe (as opposed to a physical system kept in a standards lab). Other scientific groups have also proposed using QPS devices as qubits in quantum computers – the fundamental unit of quantum information at the heart of such computers. Resistors are needed to isolate the fragile quantum states in QPS devices from the noisy classical world, said Paul Warburton, an experimentalist at the London Centre for Nanotechnology who studies the electronic properties of nanoscale devices. “In the application as a current standard, the resistors also enable the device to operate stably,” he added. Yet standard materials used to make resistors for integrated circuits do not typically provide enough resistance in a small enough form to meet the requirements for QPS circuits. Warburton and his colleagues turned to the compound chromium oxide to create new high-value, compact nanoscale resistors. 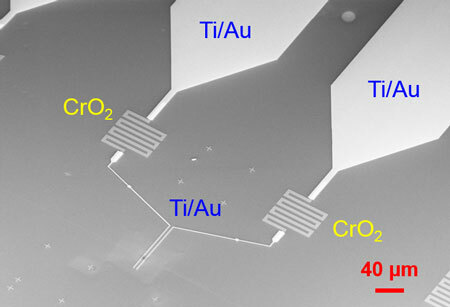 The researchers created thin films of chromium oxide using a technique called sputter deposition. They were able to tune the resistance of the chromium oxide films by controlling the oxygen content of the films: the higher the oxygen content, the higher the resistance. “Replacing chromium with oxygen affects both the numbers of electrons available to carry current and also the availability of paths for electrons to hop through the material,” explained Warburton. The researchers cooled their resistors to 4.2 degrees Kelvin and measured the resistivity for a range of oxygen-to-chromium mass ratios. Poorly conducting materials, such as the chromium oxide thin films the researchers tested, generally have higher resistance at low temperatures, and any resistor used in a QPS device would have to operate at a cold enough temperature that quantum effects would dominate over classical effects. For the resistors with the highest oxygen content, the researchers measured a resistance high enough to be compatible with most QPS circuit requirements. The teams also characterized the contact resistance of one chromium oxide thin film at an interface with niobium-silicon. Creating a QPS circuit with niobium silicon nanowires would be one way to measure a new quantum standard for the amp. The team found that creating a gold intermediate layer between the chromium oxide and the niobium-silicon lowers the contact resistance – a favorable outcome. The team next plans to incorporate their new resistors into QPS devices.